Open Source Instruments Inc. (OSI) proposes to develop an fully-implantable optogenetic stimulator with integrated EEG monitoring that is small enough to implant in adult mice. The Mouse-Sized Implantable Sensor with Lamp (MSISL) will be implanted in the mouse's abdoment and connect by flexible leads to a Fiber-Coupled LED (FCL) mounted upon the mouse's skull. The MSISL specified in this proposal will have volume no more than 1.0 ml. Figure: Physical Model of the MSISL. Volume 0.8 ml. The circuit board (left part) provides sufficient area for all MSISL components. The battery (right part) is a 19 mA-hr LiPo rechargeable battery, sufficient to provide 3000 hr of standby time. When the animal is large enough to tolerate a larger implant, we can increase the volume of the battery, and thus increase the operating life of the device. The MSISL will carry sufficient programmable logic and memory to permit future implementation of on-board seizure detection and stimulus generation, so as to permit closed-loop seizure response. We leave the writing of the logic program necessary to implement seizure-detection on the MSISL to a later development project. The FCL will deliver at least 5 mW of blue light or 2 mW of green light to the tip of a 220-μm diameter optical fiber. The FCL will mount on the skull of a mouse and require connection only to an implanted MSISL. A single command transmitted by our existing Command Transmitter (A3029C) will direct the MSISL to generate a sequence of flashes, report its battery voltage, and enable EEG monitoring. The EEG monitoring provided by the MSISL will be same high-fidelity, low-noise, recording we have been providing with our Subcutaneous Transmitters. The proposed MSISL will meet the following specification. Table 1: Target Specifications for the Mouse-Sized Implantable Stimulator with Lamp (MSISL). The implantable MSISL device will be designed to be used at least ten times in order to reduce the per-implantation cost of the MSISL/FCL system. Before each implantation, the MSISL may be re-charged to full capacity. During operation, the MSISL will monitor its own battery voltage and shut down when its battery capacity drops below 5% so as to avoid damage to the battery. By this means, the battery capacity will remain >90% of its original capacity through successive recharging cycles. The useful life of the device will be limited by the resilience of its leads and encapsulation. We will guarantee the device against manufacturing defect, fatigue failure, or corrosion damage for one year after delivery. Table: Target Specifications for the Fiber-Coupled LED (FCL). We do not intend for the FCL to be used more than once. When the optical fiber, LED, and power sockets are removed from an animal, the skull will have to come with them. Damage to the tip of the optical fiber is likely. Cleaning the contacts inside the sockets, even after soaking in acetone, will be hard. We propose that the cost of each MSISL/FCL implantation include a fresh FCL. If we assume ten uses of each MSISL, then the per-implantation cost of the MSISL/FCL components will be $200. Figure: The MSISL with FCL and Other Stimulators. Not shown in the diagram is an additional grounding lead that accompanies the stimulator leads. Four times we applied to the National Institute of Health (NIH) for a Small Business Initiative Research (SBIR) grant to fund development of the MSISL and FCL. Four times we were refused. You will find our proposed development described and compared to competing optogenetic devices in our SBIR application Research Strategy, and a summary of the objectives of the ISL/FCL development in our SBIR application Specific Aims. Or most recent application you will find here, and reviewer's comments here. We now propose to undertake the MSISL and FCL development in collaboration with several institutes. These institutes will together contribute the funds necessary to design and build the devices, and they will each test the devices in animals during the development. We will begin with a twelve-month development of the MSISL, with a $26k US contribution from our collaborators. The MSISL we can test with our larger 3-mm square LEDs and 400-μm fibers in rats or in mice with the understanding that the fiber diameter and head fixture may be too large for long-term experiments. If the MSISL is successful we will follow with a six-month development of the mouse-sized FCL, with a $16k US contribution from our collaborators. The ISL/FCL development follows upon the development of the Implantable Sensor with Lamp (ISL) for rats. The cost of the A3030E development was shared by the Institute of Neurology (ION) at University College London, which paid $150k to OSI, and OSI itself, which contributed $20k to complete the development. All hardware and software development was done at OSI, and all animal testing was done at ION. The ISL is now in final trials at ION. The proposed ISL circuit is a simplified and smaller version of the A3030E. The FCL is a smaller version of the A3024HFD. Figure: Rat-Sized Fiber-Coupled LED. 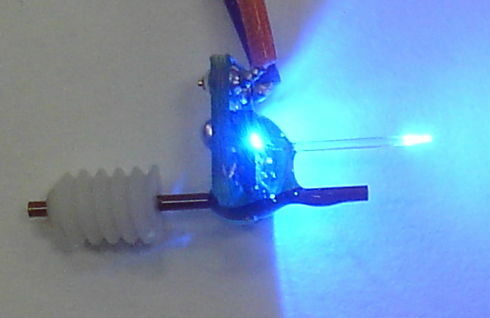 A tapered 8-mm long fiber is glued to a 480-μm square LED. A guide cannula permits injections near the site of optical stimulation. The A3030E has volume 4.5 ml once encapsulated with its 190-mAhr rechargeable battery and covered with three coats of silicone. Its single antenna serves both to receive commands and to transmit EEG samples, both of which take place in the unlicensed 902-928 MHz ISM band. The A3030E logic chip is in a 100-pin TQFP package measuring 14 mm × 14 mm. The same logic chip is available in a 2.5 mm × 2.5 mm package, and it is this smaller package we propose to use in the mouse-sized ISL. Figure: Rat-Sized Implantable Sensor With Lamp (A3030E). The A3030E solves two major problems encountered in the A3030D, and adds several new features. The A3030D was plagued by lamp artifact, which is corruption of the EEG caused by lamp current flowing from the head fixture to the EEG inputs through tunnels saturated with conducting body fluid. Figure: Lamp Artifact in the A3030D. We see current flowing from L+ to X− when lamp is on. Voltages with respect to the implanted A3030D's 0V supply. Head fixture made of dental cement. The A3030E reduces lamp artifact by two orders of magnitude by means of a differential EEG amplifier and a grounded strain relief around the lamp leads where they enter the head fixture. Figure: Lamp Artifact Suppression in the A3030E. 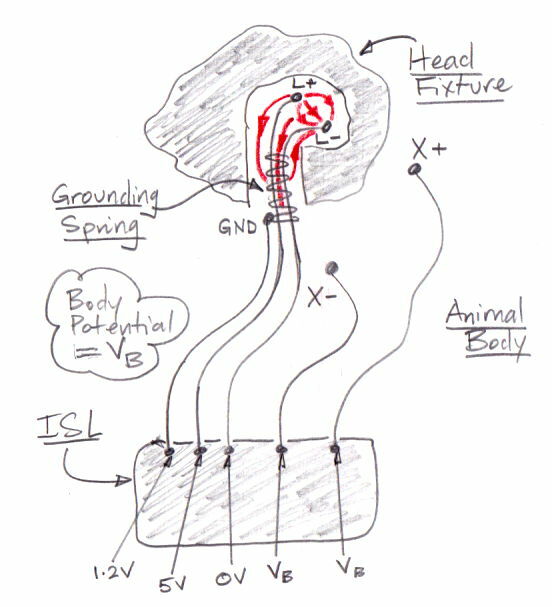 The head fixture tunnel is grounded by a dedicated grounding spring. A differential amplifier with high impedance amplifies the difference between X+ and X−. The A3030D tended to become less sensitive to commands after several weeks implanted. This we believe was due to corrosion compromising a 10-MΩ resistor in the crystal radio. The A3030E suppresses corrosion by use of a more thorough, cavity-free encapsulation procedure, and the resistor is now 1 MΩ, and therefore ten times more resistant to corrosion. 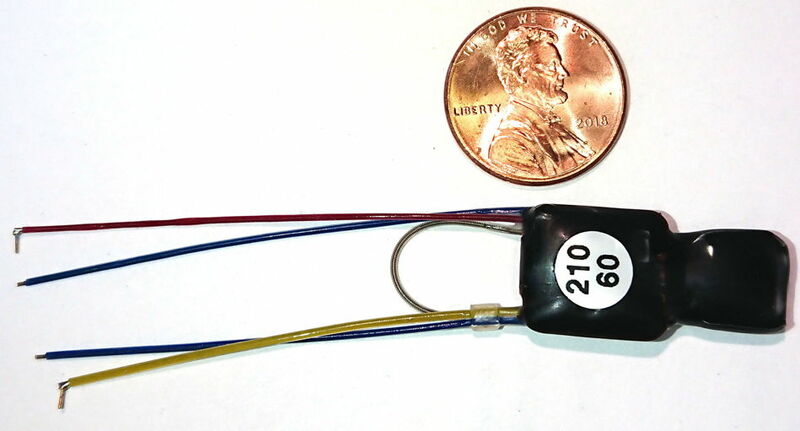 In addition to solving these two major problems, the A3030E may be re-charged through its lamp leads, combined the transmit and receive antennas into one, and eliminated lamp artifact arising within the circuit itself through an improved arrangement of components and more thorough grounding. The proposed ISL circuit consists of the following components. Diodes that permit the battery to be re-charged through the lamp leads between implantations. The mouse-sized ISL circuit must be smaller than the existing A3030E device designed for rats. In order to reduce its size, we move from a 14-mm square logic chip to a 2.5-mm square package containing exactly the same logic function. For EEG amplification, instead of a three-pole low-pass filter, we implement a single-pole low-pass filter and over-sample in logic before taking the average in logic, so as to save half a dozen resistors and capacitors. Instead of pumping 5.0 V for lamp power from the 3.6-V battery, we deliver power to the LED directly from 3.6 V through two short leads. The leads are only 45 mm in mice, compared to 150 mm in rats. Their resistance is lower, allowing us to drive the lamp current into the LED with only 3.6 V, while we needed 5.0 V in rats. This eliminates the boost converter and inductor of the A3030E. A few other package reductions and component eliminations combine to produce the following draft circuit diagram. Figure: Draft Schematic of Implantable Stimulator with Monitor Circuit. The ISL's 19 mA-hr lithium-polymer battery may be recharged through its lamp leads. The two transistor switches Q3 and Q2 have substrate diodes that allow us to apply a positive voltage to L+ and a negative voltage to L− to charge the battery. This recharge polarity is opposite to that required by the A3030E. This recharge polarity precludes recharging the ISL while it is implanted with an LED connected to the lamp terminals. The device must be removed, the LED disconnected, and the lamp pins cleaned off before recharging. In order to support the possibility of recharging with an LED connected to the pins, we would have to add two diodes, which requires more space. 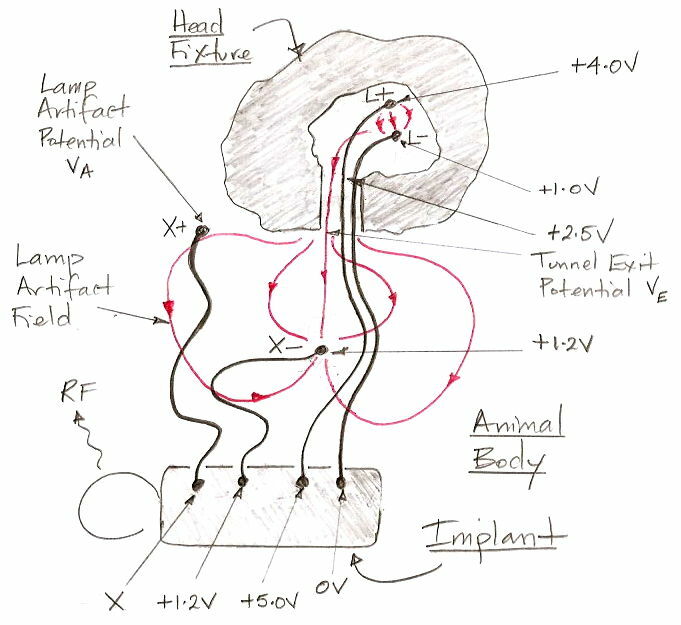 In order to make recharging while implanted possible, we would need to make the lamp terminals available also as sockets on the top of the head fixture, which would complicate our efforts to isolate the lamp terminals from the animal body to suppress lamp artifact. If, however, we find that there is space on the circuit board for these two diodes, and our collaborators figure out a way to recharge the battery through a head fixture, we will add them. The mouse-sized FCL head fixture must be smaller than the existing A3024HFD, and it must illuminate a smaller fiber. The A3024HFD used a 450-μm fiber with an EZ500 LED with light-emitting area 480 μm square. The mouse-sized FCL will use the same type of fiber, numerical aperture 0.86 for maximum coupling of LED light, but with a 220-μm diameter fiber more suitable for use in the smaller mouse brain. For efficient use of the ISL stimulus power, we need an LED with emitting area comparable to our smaller fiber. The TR2227 series LEDs from Cree are 220 μm × 270 μm with bottom-side bonding pads. We have a quotation from an assembly company to load these LEDs onto a printed circuit board and fasten them in place with conductive epoxy. We will modify our fiber-tapering procedure to produce 6-mm long fibers with 2-mm tapered tips to carry light from the LEDs. We will lower these fibers down onto the LED and glue in place much as we did for the larger A3024HFD assembly. Here are what we see as the greatest technical challenges we must overcome in the course of the ISL development. Fitting all required parts onto a small enough circuit board to meet the 1.5 ml volume requirement. Sufficiently thin but adequately reliable epoxy and silicone encapsulation to meet the 1.5-ml volume requirement. Mounting a quarter-millimeter square LED onto a printed circuit board. Producing 6-mm tapered fibers with 220-μ diameter. Assuring corrosion resistance of smaller parts in humidity. Stopping corrosion of dual-purpose lamp and recharging leads due to leakage current. Suppression of lamp artifact in smaller volume at the head fixture. The total cost of development of the mouse-sized implantable sensor with lamp (MSISL) and the mouse-sized fiber-coupled light-emitting diode (FCL) is $42k. Of this, $26k will be devoted to the development of the MSISL circuit, and the remaining $16k to the development of the mouse-sized FCL head fixture. We propose to begin with the MSISL development, and use our existing 3-mm square LEDs and 400-μm optical fiber in both rats and mice until the smaller mouse-sized FCL becomes available. We break down the MSISL development cost as follows. We propose that two or more collaborating institutes place a purchase order for thirteen of the MSISL circuits. We will deliver the thirteen in three generations of four or five pieces each over the course of twelve months. Each generation consists of several months work at OSI to assemble the devices followed by one or two months work at the collaborating institutes to check that the implanted MSISLs are able to flash their lights and perform their function without eletrical or mechanical failure. With each MSISL device, OSI will provide a head fixture consisting of a blue light-emitting diode and a 400-μm tapered fiber. During the course of the development, OSI will bill the collaborating institutes for partial delivery of the devices. We propose that the mouse-sized FCL development take place once the MSISL has proved itself effective and reliable. We break down the mouse-sized FCL development as follows. We propose that two or more collaborating institutes place a purchase order for sixteen of the FCL head fixtures. We will deliver the sixteen in two generations of over the course of six months. The first generation will be optically and electrically functional, but we will seek comment from the collaborators as to how we can improve the mechanical design of the head fixture, and await tests of the efficacy of the lamp current isolation. During the course of the development, OSI will bill the collaborating institutes for partial delivery of the head fixtures. We propose an eighteen-month collaboration between Open Source Instruments Inc. (OSI) and one or more institutes to develop a fully-implantable optogenetic stimulator, EEG monitor, and fiber-coupled LED for mice. The first twelve months will produce a working MSISL and the next six months a working FCL suitable for mice. Because we have already developed a rat-sized device that perfoms the same functions, we have only to miniaturize this existing design. We do not expect to encounter any major technical challenges in this development. The cost to the collaborating institutes will be limited to $26k for the MSISL development and $16k for the FCL development. All additional and unexpected costs will be covered by the OSI. We leave to future collaboration the development of on-board seizure detection and response so that the MSISL and FCL can perform closed-loop seizure response, with the idea that such a device will eventually permit the study of optogenetic suppression of seizures.